I have been following a number of the LPGA players on twitter and it is really amazing how much information they share about their personal lives. Yes, they do promote events they are attending and products they use (or should I say endorse) but overall the tweets are not commercial. In fact, many of the ladies are quite funny. 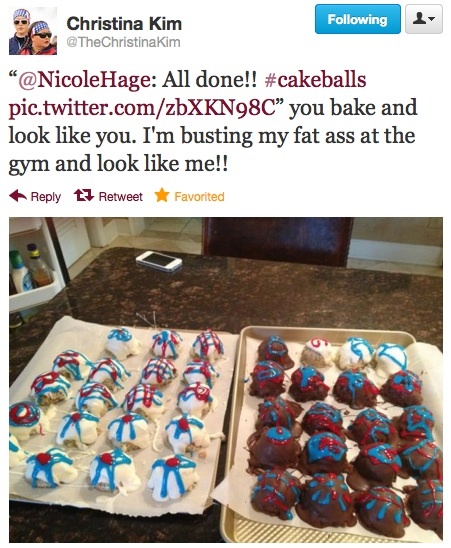 The best tweets involve photos, food and/or drink, insider jokes, and conversations between players. Below are some examples. If you are not familiar with Twitter, I’ll do my best to explain. 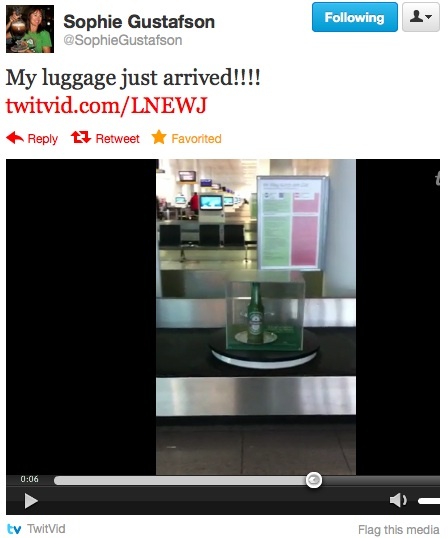 One thing to keep in mind is that anytime you see a twitter handle (like @ChristinaKim) just replace it with a name. Here we go…. Now, Kim has been tweeting a lot about her workouts at the gym (which adds to this already funny tweet.) If you don’t know this…in the tweet above, there is a photo, Kim is the women in the front (that’s Michelle Wei behind her and the photo is from the Solheim Cup). Here is a Photo of Nicole Hage. I had to add the photo because Kim said “you bake, and look like you” (so I know my readers would ask, so what does Nicole Hage look like). Now, many of you who read my blog know I have written about slow play and how it is bad for the game. So here is a funny tweet between two players about the time it took to play a Pro-Am tournament. As you can see, Kim’s reply comes after Pettersens’ text..5:50, Stop exaggerating. Ugh! The joke is self-evident. Hopefully, now you get how to read the tweets. Below is a “tweet conversation” that I loved because the players are exchanging a bit of “teasing” before a match. 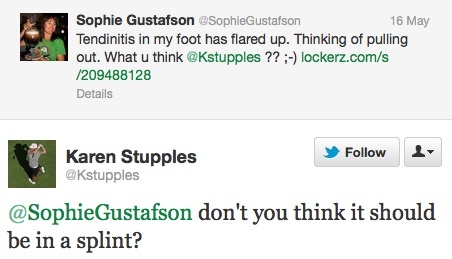 Sophie Gustafson and Karen Stupples were scheduled to go head-to-head in match play (this was tweeted the night before the match). And, Gustafson attached photo of her foot…to which, Karen later tweeted..love the golf tan. Here is a great tweet from Karen Stupples regarding a rain delay. 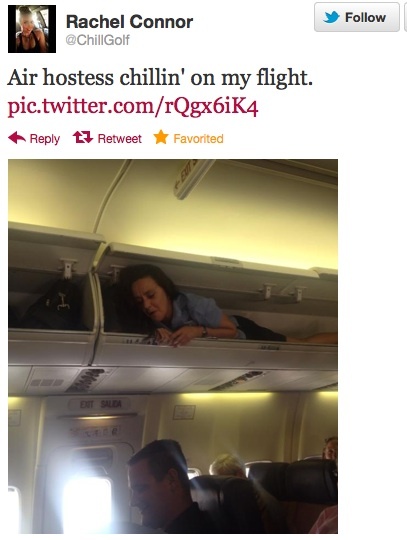 I guess as a traveling golfer you see it all. Here is a photo tweeted from Rachel Connor. There are so many more good tweets I could show but this post would just get too long. I want to end with two that are not really “funny” like the ones about; but show the great support these players give each other (as friends) on tour. This week, at the ShopRite tournament, the LPGA will promote the use of twitter by adding player’s twitter handles to name tags that go on the back of the caddie’s bib. Now, as a fan, I already follow my favorites. So the bibs are interesting but I’m not sure it will get me to follow more. As a marketing professional, I say “good for the LPGA for trying something new;” and I will be interested to see if it impacts individual player’s (i.e. will they get more followers.) I plan to do my own research and see if I see any spikes in followers for the players. 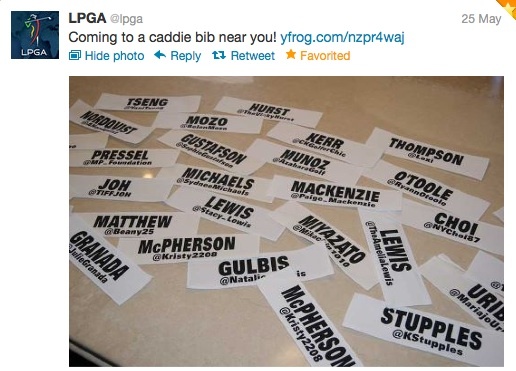 By the way, the LPGA did tweet about the new name tags. This week the Honda Classic is played at the Champions course, PGA National in Florida. It is most famous for three holes (15,16, and 17) that are statistically some of the hardest holes on the PGA tour. This 3-hole stretch of golf is called “The Bear Trap.” At the 15th hole there is a large bear statue and a plaque for The Bear Trap. It was designed by Jack Nicklaus (whose nickname is “The Golden Bear). Below is a video of Nicklaus describing the holes; as well as Nick Price describing it from a players perspective. Amen Corner at Augusta National (holes 11,12, and 13) where the Masters Tournament is played in early April. This is probably the most famous nickname and was coined by Herbert Warren Wind in an article he wrote for Sports Illustrated in 1958. The Green Mile at Quail Hollow (holes 16,17, and 18) where the Wells Fargo Championship is played end of April. The Horrible Horseshoe at Colonial (holes 3,4, and 5) where the Crowne Plaza Invitational is played in late May. Of course, this makes we wonder if I have a really good memory or watch way too much golf (I’m afraid it is probably the latter). The super bowl was last night and hard-core New England fans might be down in the dumps because the Pats lost. Not me. I am focused on humor today. Once again there were some great commercials during the super bowl; including a new E*Trade Baby Commercial. I love the E*Trade Baby and it reminded me of my favorites ads. It’s Monday, football (like golf) is just a game. If the ads above don’t make you chuckle, find something that does put a smile on your face today.